Across three decades, Martina Hingis captured 25 major championships, a career Grand Slam in both doubles and mixed doubles and one US Open singles crown. Her recent doubles success – she won 10 major titles from 2015-17 in women's and mixed competition – leaves a trophy-tinted bow on her legendary career, but the Swiss Miss truly carved her name into tennis history as a teen in the late 1990s. After a breakout 1996 season in which she finished at No. 6 in the WTA Tour rankings as a 16-year-old, Hingis put together one of the great years in women's tennis history in 1997. As part of a 38-match winning streak, she became the youngest-ever tennis player, man or woman, to win a Grand Slam singles title by taking the 1997 Australian Open. That soon led to another "youngest-ever" accomplishment, when Hingis became world No. 1 in March of that year. Her grip on the top ranking tightened when she won Wimbledon and reached the French Open final that summer, and the Czech-born Swiss capped her historic year with the US Open title. In just her third season as a professional, and without even a Grand Slam final appearance to her name going into the campaign, Hingis ended up just one match short of a calendar-year Grand Slam. 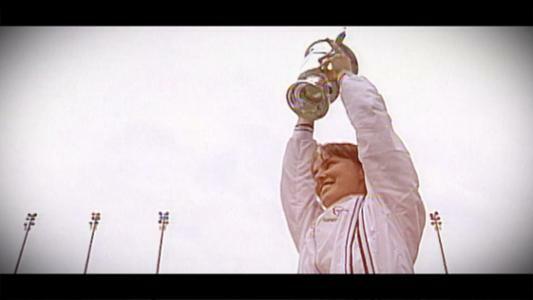 Steffi Graff was the last woman to accomplish the feat, when she won a "Golden Slam" in 1988 that included Olympic gold. At the 1997 US Open, Hingis was at her punishing best, claiming the title without losing a set – a feat she also accomplished in Australia. In fact, she was not even pushed so far as a tiebreak in any of her seven matches in New York. Her path to the title went through No. 10 Arantxa Sanchez Vicario of Spain in the quarterfinals, No. 6 Lindsay Davenport in the semis and an unseeded Venus Williams in the final. In that final, Hingis overwhelmed a 17-year-old Williams, 6-0, 6-4, in the American's US Open debut. Ironically, Hingis was the younger of the two in that match, despite having a great deal more experience on tour. The Swiss would not turn 17 until after lifting the US Open trophy. Hingis would end the year at No. 1, and she added two more Australian Open singles titles in 1998 and 1999 – the last of her five career major singles championships. After 80 weeks at the top, she lost her world No. 1 ranking to American Lindsay Davenport in October 1998 but regained it at year's end in both 1999 and 2000. Overall, her 209 weeks at No. 1 are fifth all-time in WTA history. Amidst all of her singles success, Hingis was also dominant on the doubles tour, highlighted by a calendar-year Grand Slam in 1998, when she won the Australian Open with Mirjana Lucic and the other three titles with Jana Novotna. Prior to that, she won her first career major as a 15-year-old in 1996, when she won the Wimbledon doubles crown with Helena Sukova. That trophy made her the youngest Grand Slam winner in tennis history. Hingis retired three times in her career, with her last announcement, in October, carrying an unmistakable air of finality. In 2003, at age 22, she retired due to injury before returning to the tour in 2005. In 2007, she again stepped away from the game, only to return for a final time in 2013. In recent years at the majors, she has been a mainstay during finals weekend in both doubles and mixed doubles. She completed a career Slam in mixed competition with her 2016 French Open title and won both events at the US Open in 2015 and 2017. Her 2017 titles in New York came partnering Chan Yung-jan and Jamie Murray, and she finished the year as the WTA's No. 1 doubles player, along with Chan. It was a fitting end to the International Tennis Hall of Famer's career, though she pledged to stay involved with the sport from the sidelines. "I am not going to walk away," Hingis told WTATennis.com after her retirement announcement. "I will always be part of the game of tennis." 50 Fact: Hingis was named after Martina Navratilova, who won four singles, nine doubles and three mixed doubles titles at the US Open.